With the phenomenon of aging population and increasing visibility of LGBT people, the well-being and social protection of LGBT elderlies has recently be-come a concern. While the Netherlands prides its tolerance and acceptance of LGBT community as well as its sound social protection system, it seems that there are still some gaps between social policy expectancy and reality. 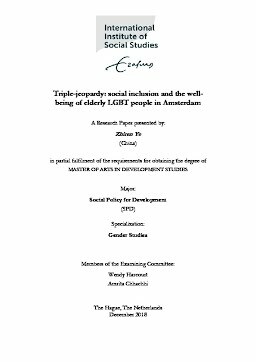 By apply-ing theory of care regime and lens of intersectionality, this research aims to reveal the triple-jeopardy in the social inclusion and well-being of elderly LGBT people in Amsterdam.